Unions and political organizations are beginning to hitch their wagons to candidates by issuing endorsements in the race for office in Long Beach. Photos by Brian Addison. 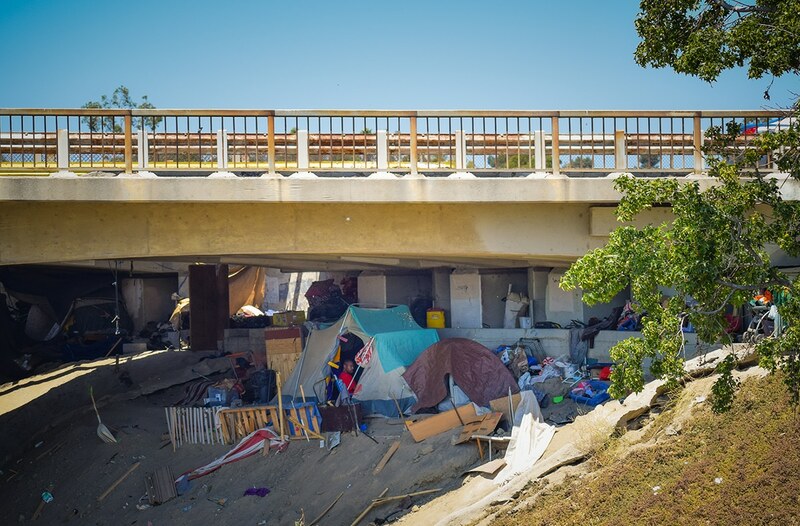 Above: an underpass along the LA River houses one of the largest camp sites for those experiencing homelessness. One time, too tired to bike home, former Long Beach Airport Director Mario Rodriguez gave me a ride home after Bob Foster held his last budget conference as Mayor of Long Beach. Mario was completely right about Garcia: he is Long Beach’s most optimistic mayor. He has been The Cheerleader of Long Beach. And rightfully so: Garcia invited a handful of journalists and this writer to talk about what’s happened over the past three years. Garcia’s admission should not be downsized. When any mayor admits, despite all the “great accomplishments,” that we are failing as a city, as a county, and as a state on the most fundamental of levels—providing accessibility to homes—we have hit crisis mode. 8,000 pairs of glasses have been given to students who need ’em for free. (By the way, we’re the largest city to offer that to their students.) Residential development is on a boom. Measure A is the largest infrastructural investment the city’s seen in a generation. Unemployment is at the lowest its ever been since the city started recording it—dropping from over 14% to under 5%. These are all, as Garcia happily noted, good things; great things even. But he saved, after all the clean infographics and positive numbers, a particular subject for last—and that is, in his eyes, the biggest challenges this city will face over the next several years. This is, in not only Garcia’s eyes but the view of many affordable housing advocates like myself, the Californian challenge of the decade. I’ve written extensively about the housing issue (which is intimately attached to the homelessness issue). This admission by Garcia is much bigger than anyone else in the room noted. Reporters asked about the Queen Mary redevelopment, the renaming of the El Dorado Library, equity in terms of where the municipal band plays, and Councilmember Jeannine Pearce’s current scandal—which, of note, people should know that the Mayor was clear: “I hope for an investigation that moves forward as it should but let me be clear: I don’t think myself or any mayor should interfere with an investigation, despite who is involved”—amongst other things… But I was the only reporter who questioned Garcia about his biggest admission yet: that despite all the “great accomplishments,” we are failing as a city, as a county, and as a state on the most fundamental of levels: providing accessibility to homes. Surely, I am not dismissing the concerns brought up; investment and attention in the things addressed by others in the room are important but inappropriate for this specific meeting. After all, we have our mayor admitting that, despite an overall drop in the city’s homelessness, this issue cannot be addressed in a silo and will become worse if we collectively do not look at the “simple math equation” he noted. We are not building enough housing. We are failing on one of the most fundamental levels of our society—and that is that the entirety our society is living under a roof. Of course, Garcia faces an uphill battle with this acknowledgement—mainly against money. Gov. Jerry Brown, pushing aside criticisms, refuses to fund affordable housing construction until it meets a fiscal balance that makes sense. Affordable housing is, bluntly put, alarmingly expensive—to the extent that funding it seems to help developers far more than those who need housing. I specifically addressed this with the Mayor: Brown’s dissolving of Redevelopment—a central source of affordable housing funds—and his refusal to fund affordable housing development until it becomes, well, affordable, is not a slight to our need but a challenge to our creativity. So I asked Garcia: How do we, as municipalities, take on the challenge from Governor Brown that we make affordable housing development work for the people who need it most? His answer? Cutting down California’s excessive red taping by way of CEQA legalities while providing incentives—not punishments—for those that do build housing. Surely, Garcia didn’t propose direct policy per se—and that is important to note. But what he does acknowledge is that we are in a situation that is the “perfect recipe for a crisis,” and we must find innovative solutions to figure this crisis out—including examining our current Housing Action Plan. Either way, it is a very clear message: we aren’t where we’re supposed to be—and it’s not just Long Beach, but our entire state.